We really cannot say enough about these extremely popular Military Cargo BDU Fatigue Pants. What started as standard uniform for our troops, now can be found everywhere the world over. 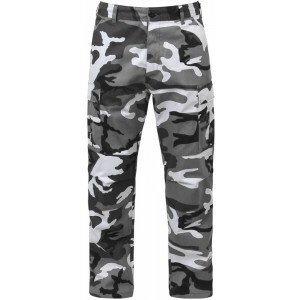 It's no surprise considering the fantastic quality of these military grade fatigue pants. You'll never lose anything when you have two extra cargo pockets and button down back pockets. The poly/cotton blend material is build to last in the toughest conditions. With reinforced seat and knees, these pants can keep up with your more intense activities while keeping you looking fashionable. Our wide range of colors and patterns provide you with the ability to blend into almost any environment or stand out amongst your friends. There is almost nothing these pants can't do. Wear them for anything from hunting and camping or if you simply want to match your style with your favorite music artists. Allmeasurements are done in inches. Not all BDU Pants are available inthese sizes. All BDU pants have adjustable tabs so pants can fitvarious waist sizes. Real waist size for pants will be the largestsize. (I.E. Size Medium will have a waist size of 35" and can becomesmaller until 31", so it will fit all the sizes in that range). Thesepants are mens sizes & cut for men, but are unisex.